Whether you live in an historic structure in Winnetka, or a new ranch house in Glencoe, keeping a clean home is a time-consuming process. 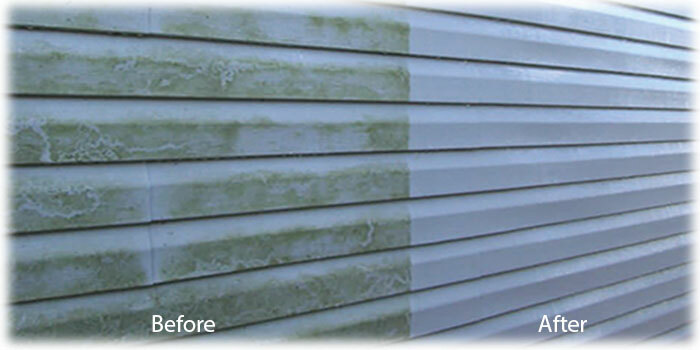 Algae, moss and other organisms can accumulate on your siding, giving it a dirty and worn appearance. But the professionals at Northern Power Washing specialize in making your home look new again – all through our comprehensive and proven house washing services. Too often, homeowners hire unqualified contractors that end up doing more damage than good. Inadequate equipment and unsatisfactory training leaves your home looking just as unsightly as before. Selecting the wrong types of detergents and fungicides can easily result in continual bacteria growth for years. The whole situation becomes a frustrating process and a waste of your time and money. At Northern Power Washing, we’re different when it comes to house washing. Your satisfaction is our number one priority, no matter the size or scope of the job. Our commitment to excellence sets us apart from the competition each and every time. Soft washing is a less intrusive house washing treatment that has been proven to kill bacteria growth while preventing damage to your home’s siding. A combination of cleaning solutions, specific to the type of surface being treated, is applied to your home and given ample time to destroy any algae or fungus build-up. Then, our team will rinse off your siding with clean, low-pressure water to ensure that any lingering cleansing products are removed. The end results will amaze you and leave your home looking new! The protection of your home and family are extremely important to us. All our cleaning products are green and eco-friendly, meaning they are safe and contain no harmful chemicals. Our soft washing team takes extra care to respect your home as if it was our own. From covering up plants with plastic, to selecting the correct house washing equipment for brickwork, we focus on doing the job right, the first time. Are mold and bacteria plaguing your home’s exterior? 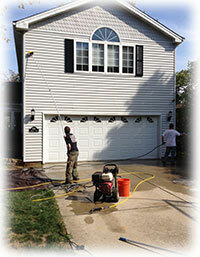 Looking for a trusted and comprehensive house washing company in Northern Chicagoland? 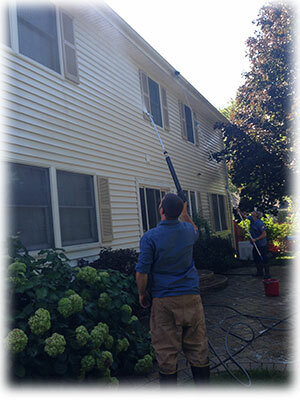 Then look no further than Northern Power Washing of Glenview. Our team of house washing experts are fully insured and certified to keep your property looking its best. Your home deserves to protected properly from harmful contaminants. For a free, in-home estimate and consultation on we can cleanse your home’s exterior, contact our house washing experts at (847)-321-8261. 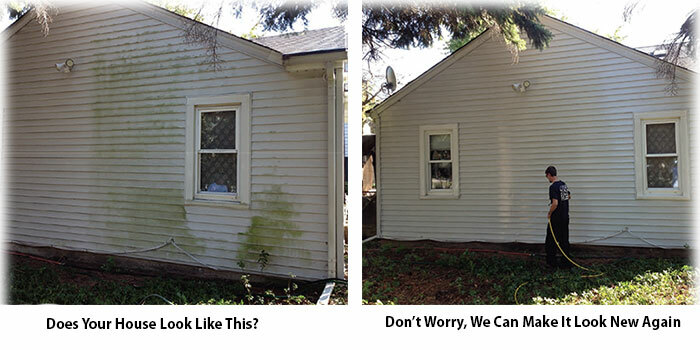 Northern Power Washing specializes in making old homes look new again. From dirt and grime to algae and moss, homes get dirty fast. Our soft washing process not only restores the original look of your home, but also kills any unwanted mildew, algae, moss and lichen growing on your home. Soft washing is the use of cleaning solutions that are comprised of mildew‐cides, algae‐cides, soaps, & surfactants. These solutions are mixed on‐site to the specific needs of the surface to be cleaned. First, the solutions are applied thoroughly to the surfaces targeted and given time to kill the mold, mildew, algae and fungus deep at its roots. Then, we rinse the surfaces thoroughly with fresh water at garden hose pressures. We take great care of all plants and landscaping by thoroughly wetting them down and or covering them with plastic when necessary. Many companies claim to softwash surfaces—make sure the company you choose has the experience and proper equipment to do the job safely! 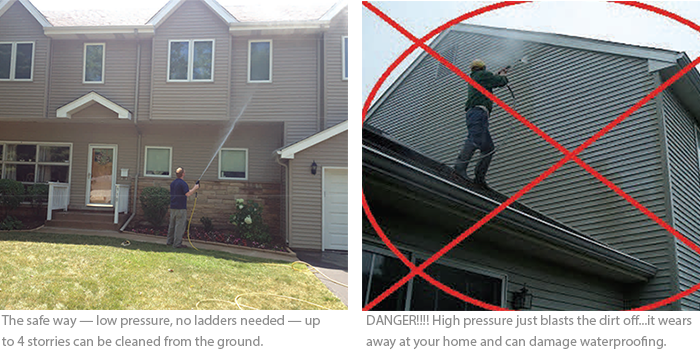 Pressure Washers Can Destroy Your Siding! Not only can an untrained person do serious damage with a pressure washer, but without the right use of soaps, detergents, and fungicides you could be wasting a lot of time and money, as you are not treating the underlying problem. We like to use the analogy of cleaning a pair of pants: to properly clean them, you would use a gentle detergent that binds with the stain that you are trying to remove, then put the garment in a washing machine to gently agitate it and rinse away the grime. Now, if you were to blast your favorite pair of jeans with a high-powered pressure washer , you would definitely get all of the visible dirt off of them… but you would also do a lot of damage to the fabric, AND there would still be a lot of dirt and bacteria left! Just because someone went to home depot and bought a pressure washer does not make them an expert, and a pressure washer is not an end-all-be-all cleaner; a pressure washer is just one tool in our toolbox. Contact us today for a free “no pressure” evaluation and quote of your cleaning needs.